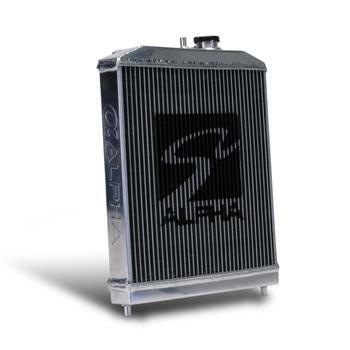 Skunk2 Alpha Series Radiator - RPM - Racing Performance Motorsport - Your source for performance parts and accessories. Skunk2’s all-aluminum, half-size Alpha Series Radiator is a direct-fit upgrade designed to dramatically increase both cooling efficiency and engine performance. Alpha Series Radiators are manufactured from lightweight and durable aluminum, feature 100-percent brazed cores, and include polished end tanks with Skunk2’s signature Alpha logo embossed along each side. Each Alpha Series Radiator features a dual-core design, high-efficiency fins for maximum cooling capabilities, and includes a genuine Skunk2 Radiator Cap for maximum performance and a premium appearance. Each Alpha Series Radiator also includes provisions for the OEM cooling fan and 1.25-inch inlets and outlets for compatibility with the original radiator hoses as well as most aftermarket ones. Skunk2’s Alpha Series Radiators are the perfect addition to any high-performance vehicle and are designed for the street, the track, or even OEM replacement purposes. Alpha Series Radiators are built to withstand harsh elements as well as against years of under-hood heat cycling. Each Alpha Series Radiator adheres to strict quality control standards and careful packaging, resulting in tubes and fins capable of optimal flow and efficient heat transfer.